House MD Episode Guide: Season 3 #303 "Informed Consent"
Third Season Episodes :: #303 "Informed Consent"
in the HOUSE episode "Informed Consent"
airing Tuesday, Sept. 19 (8:00-9:00 PM ET/PT) on FOX. Ezra Powell, a 71 year old cancer research specialist, who collapsed and was nibbled by his lab rat. He has trouble breathing. The team aren't sure if the patient's breathing problems are due to his heart or lungs. When they can't tell what is going wrong, the patient refuses all tests in an effort to just end it all. House makes a deal with the patient, who wants to end his life, that if House can't make a diagnosis within 24 hours, he will help Powell kill himself. Later House lies to the patient about a diagnosis and then breaks his agreement. And then one of the team does help Powell kill himself. Amyloidosis in Powell's "lungs, kidneys, bone marrow, and brain": "the subtype is AA. It's terminal." Guy with a cold, whose teenage daughter starts exhibiting an interest in House. House starts using the cane again. Guest Cast: Joel Grey as Ezra; Stephanie Venditto as Nurse Brenda; Leighton Meester as Ali; William Charlton as Mark; Bobbin Bergstrom as Nurse. Cameron about the patient, who says he wants to die: "He's thought this through, it's not an impulsive decision." House: "Neither is mine. He's depressed. He'll feel much better after we cure him." Chase: "He's seen all the tests we've seen. Even if we figure out what was causing the lung damage, it's too late to reverse it." House: "You can't know that without knowing what's wrong." Foreman: "So what do we do? We put a plastic bag over his head and get it over with?" Chase: "No, we— give him a syringe full of morphine. Every doctor I've ever practiced with has done it. They don't want to, they don't like to, but that's the way it is." Foreman: "I haven't, I won't." Cameron: "I couldn't do it either." House (Hugh Laurie) treats a famous cancer researcher (guest star Joel Grey) in the HOUSE episode "Informed Consent" airing Tuesday, Sept. 19 (8:00-9:00 PM ET/PT) on FOX. Chase: "You just said we should respect his decision." Cameron: "Respect it doesn't necessarily mean we honor it." Chase: "Right. Just means we talk about it. [pause] At some point, doing no harm has to mean we allow nature to take its course, not stubbornly standing in the way of it." Foreman: "Sticking a metal syringe into a plastic I.V. line and pumping in a lethal dose of morphine is not letting nature take its course. Not according to the state of New Jersey." Cameron: "So it's better we allow him to slowly suffocate in his own plasma?" Foreman: "Whose side are you on, senator? First respect his wishes, then invade Iraq, then get the troops home. Make up your mind." House: "Wow. Certainly a lot of interesting things to consider. Stress EKG rules out the heart, which means something's gotta be attacking his lungs. Mycoplasma or strep pneumo, which probably means it's too late to do anything about it. We could try leuvofloxicin—"
Cameron: "Coming up with a new treatment isn't gonna do us any good unless we convince him it's worth trying." House to his patient: "You came to me, I didn't come to you." Powell: "I figured you'd have the guts to do what had to be done, if it came to that.... We don't choose our birth, and we don't choose our death." House: "What if you could? How 'bout we make a deal? Give me one more day. If I don't find out exactly what's wrong with you by then, I help you die." House: "24 hours. Come on, it's not gonna kill you." 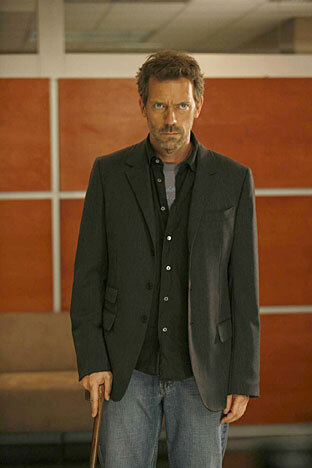 House: "Old guy. Lungs. Fluid. Go." Foreman: "You can NOT help him kill himself." House: "Of course I can. Chase says we do it all the time. Cameron: "Cuddy's not gonna let you—"
House: "Enough! You don't want me to kill him. Fine. Here's a big shock: I don't wanna kill him either. How do I not kill him? By you guys doing your job. We have 24 hours to figure out what's wrong with him. Tick tock, tick tock." House to Powell: Just give me 12 more hours." Powell: "We had a deal. No more tests." House: "Fair enough. Give me six more hours." Listen, there is no evidence that you are terminal." The music towards the end was Mazzy Star's "Into Dust" which is available on the album "So Tonight That I Might See". You can listen to this on the main Amazon page on the album. Powell: "You a man of your word or not?" House: "No, as a matter of fact, I'm not." Powell: "Fine. Then discharge me. My lungs will slowly fill with fluid, I'll gasp to catch every breath, but never can. Every breath will be petrifying. It'll be slow, painful, torturous. You really gonna let me die like that?" Powell: "I've always wondered exactly what was on the other side." House to Cuddy: "Thought you were only supposed to put on a pound a week during your last trimester." Cuddy: "I'm not pregnant. I heard about your little stunt with Dr. Powell." House: "Not really a stunt. More of a trick, a ruse, a hoodwink." House, referring to a lie Cuddy had told him previously [Cane and Able]: "Ok. Lying is sometimes good, right? Like when you're trying to teach someone a lesson about humility, or something. All I'm trying to do is save his life. He's not gonna learn anything; I just thought the same principle might apply." House: "I coulda just let him die." Cuddy: "Not gonna get sued for keeping him alive." House: "Well, we could; we completely disregarded his wishes." Cuddy: "Do you want me to disagree with you? Want me to yell at you?" Cuddy: "We're doctors: We treat patients, we don't kill them." 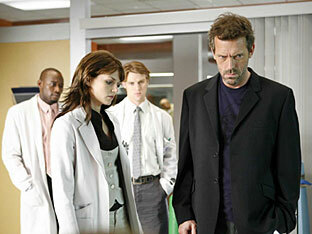 House: "How right you are, Dr. Cuddy! We also don't pad our bills, swipe samples from the pharmacy, or fantasize about the teenage daughters of our patients, either." Cuddy: "True, better be true, and you're a pig." Wilson: "He's not asking you to help him kill himself; he's just asking for help. The disease will kill him." House: "I know what he was asking for; I just said 'no'." Wilson: "You've done it before. Plenty of times." House: "To patients that I knew were terminal." Wilson: "Oh, give me a break. This has nothing to do with saving a life; you just can't bear the thought of a patient dying before you've been able to figure out why." House: "If we're gonna keep refusing to cure patients just to reign in my ego, then we might start having a little problem with patient recruitment." Wilson: "Worried about meeting your one patient a week quota?" House: "I'm a cripple, remember. Accommodations must be made." Cameron: "You radiated babies. Just like that. No forms, no questions, nothing. Who knows how many cancers you caused." Powell: "I don't know. What I do know is we discovered techniques that prevent fatal kidney failures in hundreds of thousands of other kids." Powell: "I don't regret what I did. Informed consent, patient rights — holds back research." Cameron takes the skin for the test House sent her to get and Powell protests: "What the hell are you doing?" Cameron: "Informed consent is holding back our diagnosis." Powell: "Good for you. Finally standing up for something; acting on what you believe." Ali, the daughter of the clinic patient who 'took to' House: "Dr. House? Hi, how are you?" House: "Not as good as you think I am." Ali: "Don't worry, I'm not stalking you. My dad just lost his medicine; he had to come back for another prescription.... Why haven't you returned any of my calls?" House: "I plan to. In a couple of years." Ali: "I was just calling to say 'thank you.' And to tell you how impressed I was; you diagnosed my dad by just looking at him." 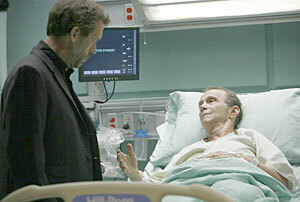 House: "Felt his glands, too." Ali: "... Oh, and, you really don't have to wait a couple of years to return my calls. Just six months; till I turn 18."